ABOUT: The Kelly Kirby program was built psychologically on the modern kindergarten method of proceeding from the ‘known’ to the ‘unknown’, and from the ‘thing’ to its ‘sign’. FREE CLASS MATERIALS: *Teaching materials are included with full semester enrolment. THE KELLY KIRBY material is presented in a series of four piano books unique in their presentation of ear training, sight reading, technique and theory. The completed course provides a thorough development in ear training and note reading (covering the complete range of the musical staff), time and note values, duple, triple and quadruple rhythm, basic musical signs, scale and chord formation in three major keys (introduction of sharps and flats), and keyboard transposition in those keys. The child’s interest is stimulated with a variety of activities, embracing these elements, as he progresses in a natural and constructive way. There are four books unique in their presentation of ear training, sight reading, technique and theory. The Kelly Kirby program offers the beginning student a proper balance between the eye and the ear which is so vital to progress and success. A Kelly Kirby graduate can move to another teacher, or even another instrument, confident that a proper foundation has been provided. 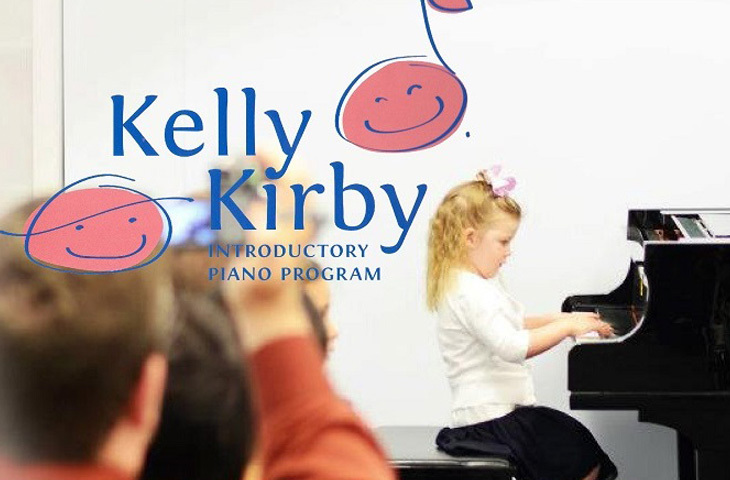 The Kelly Kirby Program is a special approach to music through the piano that provides a complete foundation for any type of music study or other instrument that a child may wish to later pursue. This method is compatible with the young child’s mentality and the material is suited to the child’s needs, laying a complete foundation for future study. The program was built psychologically on the modern kindergarten method of proceeding from the ‘known’ to the ‘unkown’, and from the ‘thing’ to its ‘sign’. The Kelly Kirby material is presented in a series of four piano books unique in their presentation of ear training, sight reading, technique and theory. The completed course provides a thorough development in ear training and note reading (covering the complete range of the musical staff), time and note values, duple, triple and quadruple rhythm, basic musical signs, scale and chord formation in three major keys (introduction of sharps and flats), and keyboard transposition in those keys. The child’s interest is stimulated with a variety of activities, embracing these elements, as he progresses in a natural and constructive way. Kelly Kirby satisfies the desire of the young child who wants to ‘play’ the piano because it is a ‘performance’ training in which ear training, sight reading and piano playing are taught from the very first lesson. Certificates are available to children who complete the program with a qualified Kelly Kirby Teacher. Workshops, auditions, recitals and scholarships are available in a non-competitive environment. As valuable and important as any research is, it cannot explain or quantify the joy and fulfillment music brings to our lives and the lives of our children! Congratulations to WMA students for OUTSTANDING results in RCM Examinations! Connect with the World of Music & Arts and get the latest news and updates! Web design/development by: 1dea Design + Media Inc.
15-yrs old pianist gets Silver Medal at the International Competition! New WMA – construction updates!